The Sapphire Scientific System is a totally new, fully-integrated carpet and hard surface cleaning system that powers out dirt and soil in a broad range of conditions. Formulated by long-time industry experts, Sapphire's full range of chemicals and Truckmount vacuums, extractors, and hard surface machines help to ensure carpets are left brilliantly clean, and hard surfaces radiant! Truckmounts that excel in portability and performance. Sapphire's full range of truckmounted carpet and hard surface machines are sure to meet all of your cleaning needs. Whether you require a strong vacuum, the best fuel efficiency, a space-saving profile, thermostatic heat control, or incredible durability, the Sapphire truckmount range offers the flexibility and performance professional cleaners need to get the job done quickly and thoroughly. Looking for the added performance available from a liquid-cooled power plant? The 570SS truckmount offers all the advantages of the Sapphire line - high performance, high heat, and durable build - plus advanced triple-source heat cogeneration to produce steady, powerful heat for fast, consistent cleaning. And Sapphire's trademark MSU (maximum space utilization) design means you get the most power from the smallest chassis, greatly simplifying maintenance and saving you valuable space in your truckmount. For the most reliable pressure, heat and vacuum, choose the 870SS. Sapphire employs premium components throughout - including the commercial-grade Ford TSG-416 powerplant - for durability and performance. And the unit's triple-source heat cogeneration delivers a deep and consistent clean even on the largest jobs. A true hard surface cleaning machine with full-pressure, full-flow heat. Finally, a truckmount that delivers the flow AND heated pressure you need to rapidly clean tile, grout, stone, concrete and more. Plus, the unit offers true versatility: use as a powerful carpet cleaning truckmount, or for restoration extraction and cleanup. The 2500HS gives you the edge over unheated units, plus delivers more vacuum, more solution pressure and a faster, deeper clean. For maximum reliability and simplified operation, chose the Pro-1200, Sapphire's premiere direct-drive truckmount. This rugged, dependable unit saves space in your vehicle and delivers robust heat and powerful extraction capabilities for all types of cleaning. A cross-bed waste tank design improves vehicle balance for greater safety, and a newly designed exhaust heat exchanger increases heat capture and reduces noise levels. 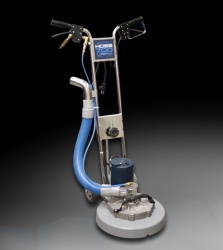 15-inch wide cleaning platform delivers up to 700 cleaning passes per minute to make fast work of the largest jobs. A unique helical solution injection pattern ensures streak-free application and thorough soil suspension, while unique floating heads provide deep agitation and a tight vacuum seal. Cleaner, dryer carpets and a stronger bottom line for your business. Fast, fatigue-free cleaning - all day long! Can effectively clean a wide range of fabrics and soiling conditions with confidence. The head and glide are constructed with extremely durable engineering plastics, and a flexible hose makes it easy to maneuver even in the tightest corners. Plus, the Upholstery Pro precision flow control allows for easy, on-the-fly adjustments, and a unique continuous flow design allows you to extract in both directions for the best clean possible. Robust filter system protects valuable equipment and increases the versatility of truckmount systems. 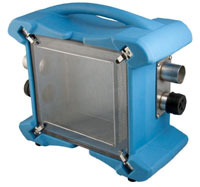 The CDV is a high capacity in-line filter box designed to capture carpet fiber and other debris extracted during carpet cleaning or flood extraction with minimal vacuum loss. Built to withstand the rigors of real-world working conditions, the CDV helps to keep your truckmount tanks clean and simplifies cleanup. Space-saving area for mixing chemicals and storage. The Chemical Workstation provides the perfect place keeping specialty spotters, pH test papers, small tools and other materials organized and safely contained. Once mounted inside your van, the fold-down lid provides the perfect platform for mixing chemicals and folds up and locks securely when done. Steel locks close the lid securely and painted steel construction ensures durability and long life. Includes interior storage pouches. Secure storage for chemicals in vehicles. 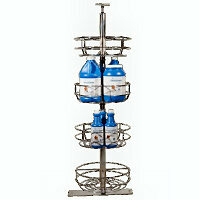 The Chemical Rack provides convenient, secure storage for gallon bottles in work vans and other vehicles. Each shelf rotates independently, allowing easy access to shelf contents. Mounts securely in most vehicle types. Sapphire's wire shelving units feature a chip resistant electroplated nickel-chrome surface, and the welded construction allows air to circulated, improves product visibility, and minimizes dust accumulation. Plus, the high gloss finish provides durable and attractive storage to keep your chemical supplies in good order and keep your operation looking good. 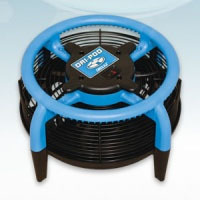 The Sapphire Scientific system is a totally new, fully-integrated carpet cleaning system that powers out dirt and soil in a broad range of conditions. Formulated by long-time industry experts, these products are built from the molecule up to greatly simplify the cleaning process, helping you to tackle even the most challenging carpet cleaning situations fast. Sapphire Scientific: Simply Better! Designed specifically for the challenges presented by area rugs, Sapphire's Area Rug Cleaning system lets you tackle the toughest of soiling conditions, spots and stains without damaging delicate or sensitive fabrics. Address soiling, odors, stabilize dyes and prevent bleeding and browning. Ideal for textile cleaning and restoration professionals looking to better their results, lessen dye migration risks, and boost productivity and profits in the process. Upholstery cleaning can be both challenging yet highly profitable. Properly applied, the Sapphire Upholstery System significantly reduces the risk of damaging fabrics and allows you to provide a service with results your customers will love. Opportunities continue to expand throughout North America for cleaning tile, stone, and concrete installations in homes, businesses and facilities. Sapphire's system of powerful, low-odor treatments make cleaning, brightening, sealing and maintaining hard surfaces fast, effective and profitable. For more information on these and other products, please call your local Wesclean Sales Professional at 1.888.337.2929. Disclaimer Sitemap © 2019 Sapphire-Wesclean Resources - WESCLEAN. All Rights Reserved.